Vintage from paul is delighted to offer this festive New, Cake Plate & Server. The Deck The Halls set is unused and in its' original box. 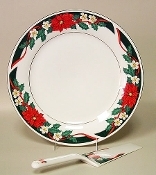 Each of the available Tienshan Deck The Halls Cake Plate & Server is in New and Pristine Condition! The Tienshan Deck The Halls Cake Plate measures 11 inches in diameter. The Deck the Halls Cake Server measures 10 inches in length, 2-1/2 inches in width.